Royal City Nursery offers you an easy and profitable way to successfully fundraise with your group! Royal City Nursery is open all year so the cards can be used at any time. Submit your order to Royal City Nursery; make arrangements for pick up and payment, then distribute the gift cards. It’s that easy! Royal City Nursery offers the best return on gift card sales anywhere, with 20% of all sales going directly to your cause. If you sell $2000 you collect $400.00! We would be pleased to work with you on your fundraising venture. We know how difficult it can be to raise funds to help you meet your target. 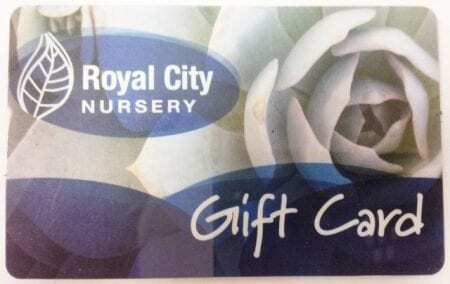 Royal City Nursery Gift Cards are easy to sell and we make it hassle-free to set up your program. Any time of year, any size group, any fundraising dream. *Please Note: Gift cards are not eligible for Landscaping or maintenance services. Get Started with Your Fundraising Here!